Whether you're doing research for an upcoming trip or you simply want to live vicariously through your fellow netizens, videos from some of the world's biggest and most impressive water parks can be utterly thrilling. Get a peek inside popular water parks and see what happens after-hours or even after they shut down for good! For perhaps one of the more unique experiences around, check out this video for an epic rave party at a water park in San Diego, California. The blacklight delivered a colorful atmosphere for a truly a 'lit' experience! Just about everything was glowing, from partygoers' faces to their shoes and from the water to the tubes. As the largest mall in North America, West Edmonton Mall in Alberta, Canada has its own water park. Sometimes it shuts down for a massively wet and wild after-hours party. This particular party in 2014 was very well-attended and included live entertainment from DJ Gareth Emery. Plummeting down 168 feet and reaching speeds of up to 45 miles per hour, the Verruckt water slide at Schlitterbahn Water Park in Kansas City was a feat to behold while it was still open. The slide was eventually shut down in 2016 after a 10-year-old boy died on the attraction. Action Park in New Jersey has a long and storied history as one of the most dangerous water parks in the nation. One of the park's recent claims to fame was creating the "World's Longest Inflatable Waterslide" at nearly 2,000 feet in length. Verified by Guinness World Records in 2015, the slide took between 60 and 90 seconds to ride. Named by U.S. News as one of the best things to do in Dubai, Wild Wadi Waterpark is like many other attractions in Dubai: large, impressive, and expensive. There are around 30 water rides and play areas in the amusement park, which is modeled after Arabian folklore character Juha. Admission to the water park is nearly $100 per adult. 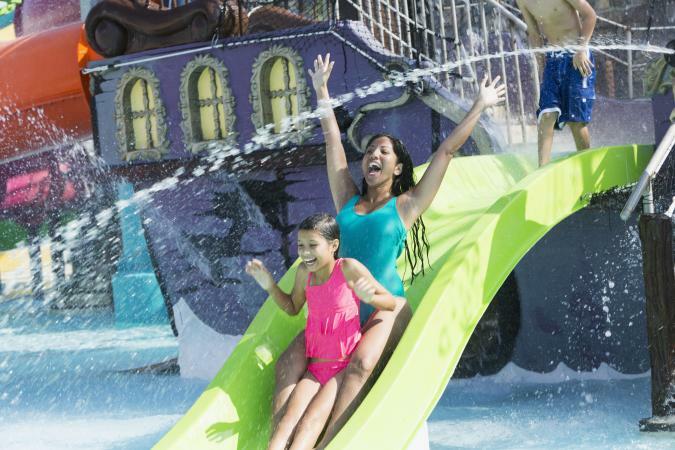 Popular with couples, as well as with families with young children, Wet 'n' Wild Hawaii is highly-rated by visitors for its array of water-filled attractions. Highlights include a simulated surfing attraction, meeting with a mermaid, and a long lazy river with waterfalls. Mahalo! America is home to some great indoor water parks and Kalahari Waterpark in Sandusky, Ohio is the biggest in the country. The circular drop looks like an absolute thrill! Not all water parks are wet. OlaBMX's YouTube channel is filled with videos where he rides his BMX bike in abandoned water parks, like this one in Tanum, Sweden. Don't try this at home! With waterproof cameras getting more powerful, affordable and accessible all the time, it's no wonder that water park videos have also increased in popularity online. Now get out there and shoot some amazing videos of your own!